You've heard of fizzy bath bombs. But have you heard of fizzy bath salts? They're a fun twist on traditional bath salts and fizzy bombs, but much easier to make than bombs. 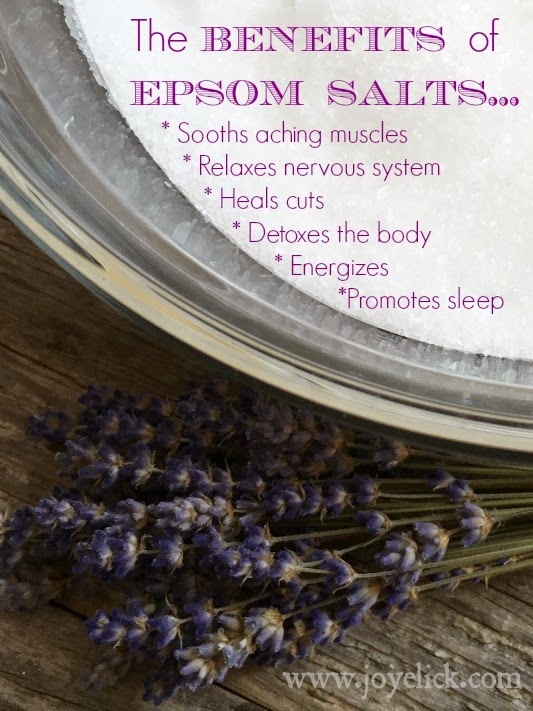 Epsom salt baths are well known as a natural remedy for various aches, pains and other ailments. 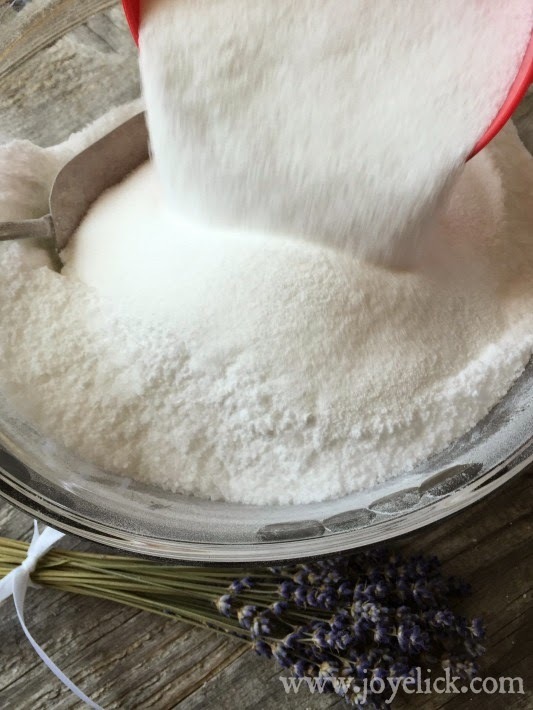 When you combine the almost magical properties of epsom salt with lavender, which has its own soothing properties, along with a couple other skin tingling ingredients, you get a bottled spa experience. Just add water and you'll see what I mean! Did you know, epsom salt is not really salt? It's actually a mineral compound of magnesium and sulfate. These minerals are absorbed easily through the skin. When we soak in a warm bath that contains dissolved epsom salt, we experience many health benefits. For one thing, our magnesium levels replenish in our bodies. Magnesium can help muscle and nerve function, reduce inflammation, relieve pain, promote relaxation, and even promote a more pleasant mood by increasing serotonin levels in the brain. Sulfate, the other mineral in epsom salt, is equally beneficial. Sulfate is likewise readily absorbed by the skin and helps detox our bodies by flushing out toxins and heavy metals from our cells. Doesn't reading all that make you want to go take an espom salt bath right now? Well, you're in luck. Today I'm going to show you how to make a fun, fizzy version of this well known remedy! * I found my vintage-look keys at a local craft store. The link provided above leads to some key charms that look slightly different, but would work just as well. Sorry, I tried to find an exact match, but couldn't. Step 1: Combine epsom salt and essential oil. You will need a bowl that is completely free of moisture. (Throughout this process, you will need to avoid getting any water in your mix, as the citric acid and baking soda react to each other when they come into contact with water). 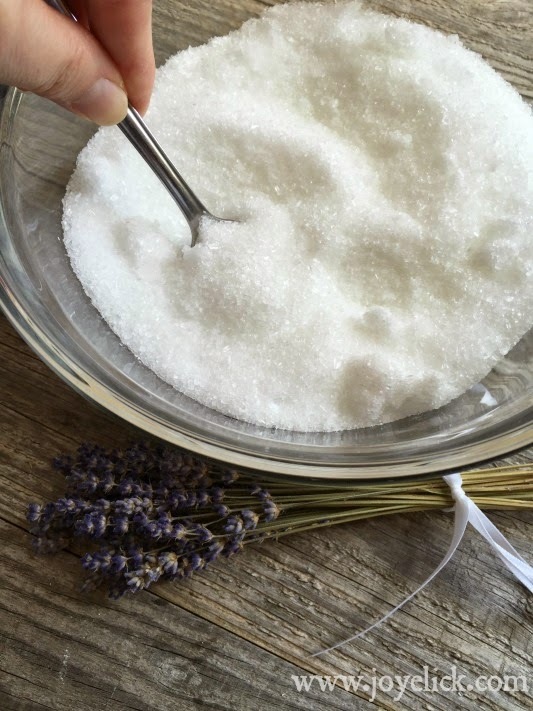 Place the epsom salt in a large dry metal or glass bowl. Add the essential oil and work it in thoroughly with a fork. (You may think of the essential oil as moisture, but it isn't the same as water and therefore won't cause the same reaction). Step 2: Add the baking soda. 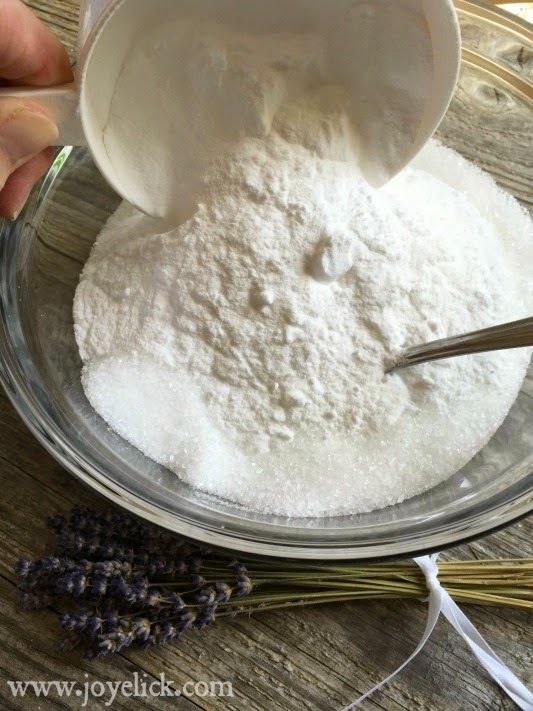 Combine the baking soda with the scented epsom salt. 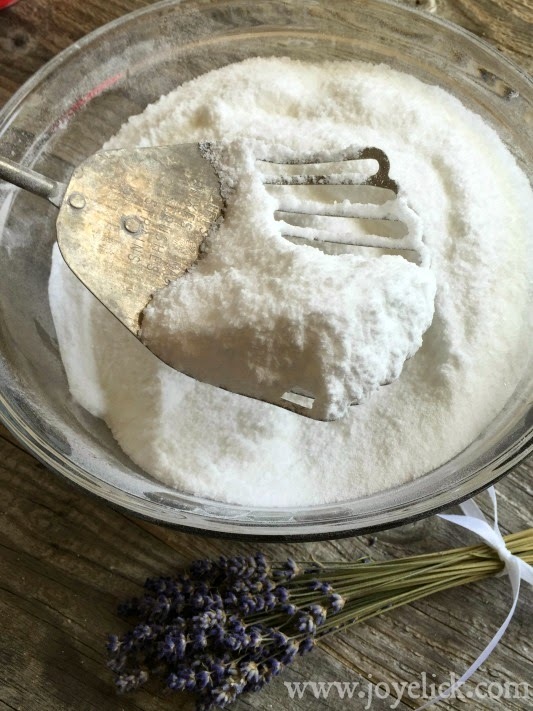 Use a whisk or a slotted spoon to sift the salt and baking soda together until they're thoroughly combined. (I have this antique slotted spatula type thing that works super well for sifting together all kinds of dry powders. I use it for things like making bath salts, as well as for mixing my ready-made mixes for my pantry). Step 4: Bottle the magic. 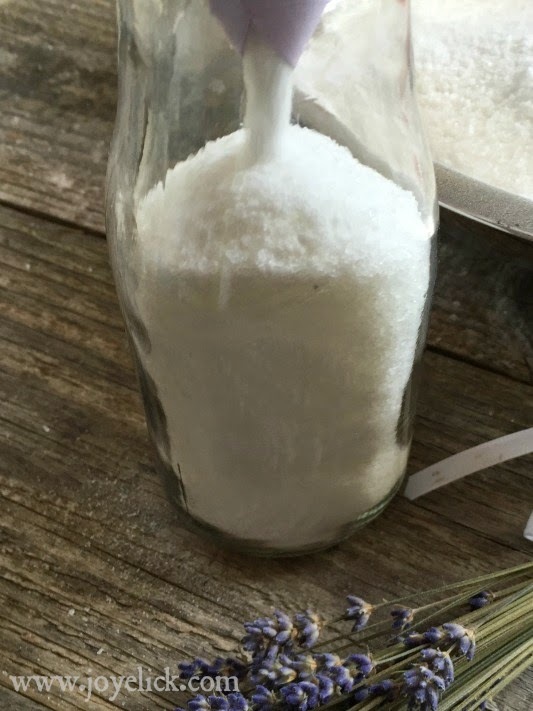 Using a funnel, or a piece of card stock rolled like a cone, fill your bottles with the bath salts. If you're not using milk bottles, choose some other glass jars or containers that will seal with an air-tight seal. You don't want moisture working its way into your salts from the air, or your salts could compact. (When it comes time to use them, if you do discover that they don't immediately pour loosely from the container, simply insert a pencil or something and stir them up to loosen them and they should pour right out). Place an air-tight lid on each bottle. Best if used within 3 months. 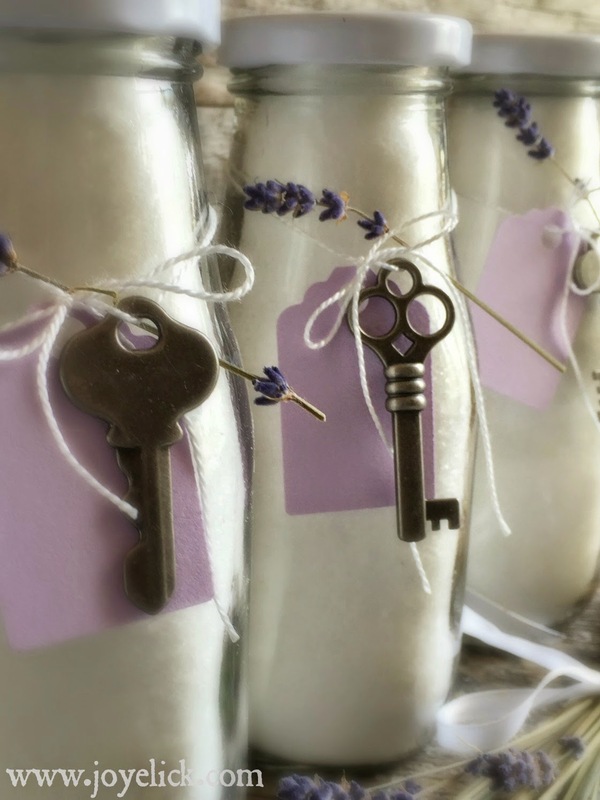 If you're planning to decorate your milk bottles with gift tags and keys, as suggested, now is the time to do it! "The key to relax is a lavender fizzy bath"
"Need to unwind? 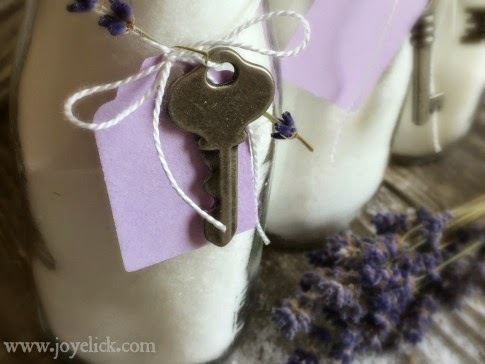 Unlock some relaxation with a lavender fizzy bath"
"All locked up? 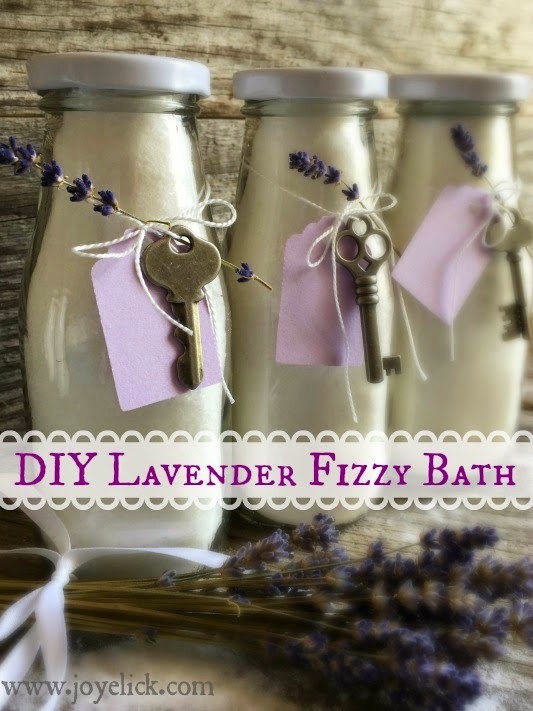 Relax with a lavender fizzy bath"
Do you have another idea? Please share it! I'd love to hear your brilliant ideas in the comments below. Do you have a cute saying as a play on words that could be used with the vintage keys on my bottles? I'd really love to hear it! Please comment below. My daughters and I made some today. It smells wonderful. How much to I use for my daughter? For her feet and bath? Hi! Yippee, you made this :-) As far as how much to use, we dump the whole bottle in for a bath, kids and adults alike. As far a foot soak, you could probably use 1/4 to 1/2 of the bottle. Enjoy! would you consider adding lavender flowers to the mix? I made this. Love how it turned out. Now for mine I added 1 cup baking soda and 1 cup whole milk powder. A standout amongst the most well-known safe cleanser is the natural cleanser. While these cleansers keep on giving relentless rivalry to the modern cleansers, they can also be effortlessly made in homes. This seems to be good to work at Systeme delivrance avis and similar cases. Tout sur les Abdominaux and La Diète 3 semaines. The table or bench is made in a way which allows the blade to jut upwards through the table, so that the material can be supported while the blade does the cutting.